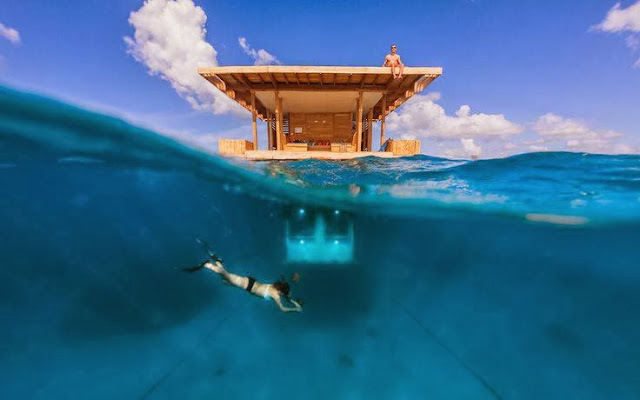 Easily accessible from the Manta Resort, the Underwater Room is completely self-contained, and is divided into two parts, the underwater and the two-floor wooden deck above water level. The bedroom underwater is accessed only via a ladder leading down below the water’s surface. Featuring a comfortable double bed, it provides the perfect platform for watching life go by so close to the seabed. The hardwood deck above is equipped with toilets and a lounging area. Guests can sleep underwater, or under the stars if they choose to; rocked to sleep by the gentle lapping of the ocean. Looking up into the skies a whole other canvas than the one we’re used to, is revealed; completely free of light pollution, the Zanzibar archipelago guarantees a crystal clear blanket of stars every night. Spotlights placed underneath each windowpane below sea level light up the room’s immediate surroundings, creating a surreal luminous view of the marine life around it which is attracted by the light source whereby the creatures swimming past almost appear to be glowing. Due to the room being situated in a clearing, known as the Blue Hole, in the coral reef measuring some 12 meters deep, guests also have the opportunity to see a more relaxed side to the ocean. Completely isolated and utterly compelling, the experience allows guests to delve deeper into a marine world than any diving experience, to really live within a marine environment and to experience its unique rhythm and colours. A night in the Manta Underwater Room costs $750 per night per person.